One hoped that this would increase awareness of the ethical considerations involved in this type of research, and in turn improve animal welfare. Instead, what seems to be happening is that many American and European scientists are avoiding these issues altogether by going elsewhere to carry out their work, where red tape is less and research can carry on without adjusting to meet rigid standards. That “elsewhere”, it seems, is China. A recent article published in Nature (http://tinyurl.com/jf5bvm4) highlighted China’s drive to become a world leader in biomedical research focusing on primates. As part of this the Chinese government is increasing funding for the construction of new biomedical laboratory facilities capable of housing more primate subjects. What this brings into question is the ethical standards of the work being done at these labs, and more particularly the standards of animal welfare. 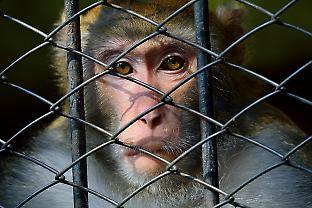 It is documented that it costs one-quarter of the price to keep an animal in a lab in China than in the US, suggesting that something is being compromised in their care. This is worrying. Perhaps partially in response to such concerns, and perhaps also in recognition of a growing concern for animal welfare among the Chinese populace, the wildlife protection law of the People’s Republic of China recently underwent an amendment that will come into force on 1 January 2017. While this new law shows marked improvement in the protection of wildlife, including wild primates, it doesn’t include legislation for the treatment of captive animals except for those “under special state protection”. It would thus seem that it fails to address the key problems faced in laboratory settings. The amended law also prohibits the sale of wildlife species unless they are required for scientific research. However, China still exports a huge number of primates for research, and this number has tripled in the past decade. This state of affairs needs to be much more carefully regulated. This is especially true given the decline of China’s wild primates, including the rhesus macaque, which is the species most often captured, and potentially bred, for scientific research. With predicted increases in the number of animals set to be used in China’s new biomedical facilities, it is not sufficient to have guidelines for the treatment of captive animals lost in the technical language of newly amended laws. Rather, it is important for all biomedical facilities in China to increase transparency in how animals are housed and treated, and for there to be a federal legislation body tasked to manage this. It is unlikely that this will happen in the near future, which means that we need to work to encourage scientists who are already committed to conserving wild primates to step into action. we must urge solutions from partnerships with a new generation of national researchers dedicated to protecting all animals, both wild and in captivity, within China. Alison Behie is Head of Biological Anthropology and Colin Groves is Emeritus Professor of Bioanthropology at The Australian National University’s School of Archaeology and Anthropology.